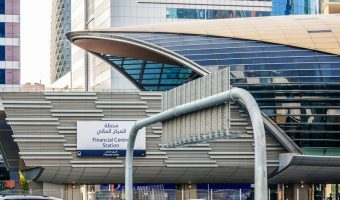 The Burj Khalifa/Dubai Mall Metro Station is a station on the Red Line of the Dubai Metro. 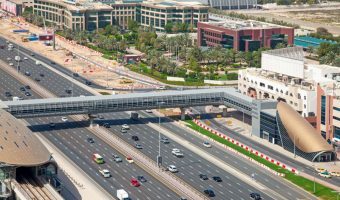 It serves the areas of Downtown Dubai and Al Wasl. 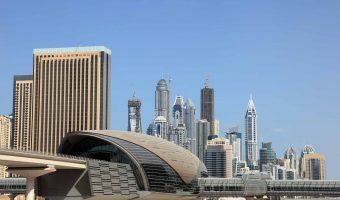 Downtown Dubai is a mixed-use development by Emaar. It is home to some of Dubai’s most popular tourist attractions. Places to visit here include the Dubai Mall, Burj Khalifa, Dubai Opera, Dubai Fountain, and Souk Al Bahar. 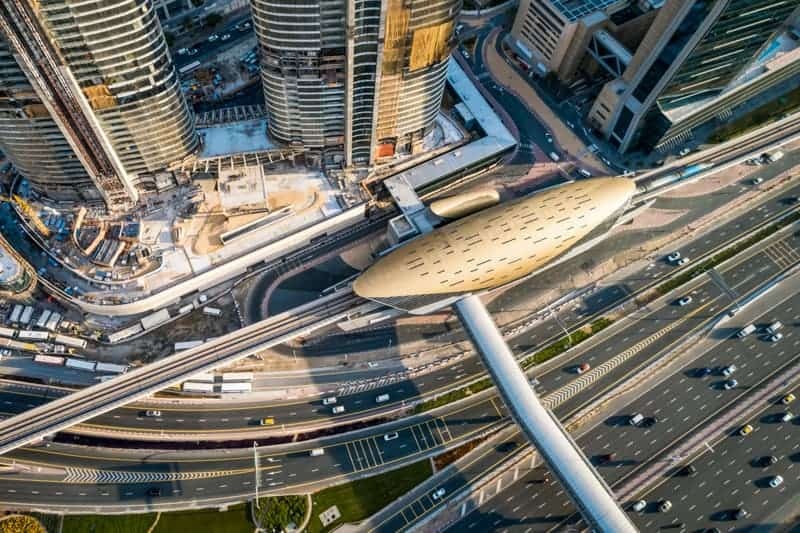 A covered pedestrian walkway connects the station directly to the Dubai Mall. It was completed in 2012 and is almost one kilometer in length. Feeder bus F13 departs from the station and goes to various destinations around Downtown Dubai (including the Dubai Mall). Al Wasl is an area to the west of the station. Places of interest here include BoxPark and CITY WALK. Adjacent stations on the Red Line are Business Bay and Financial Centre. 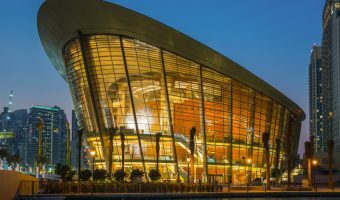 Dubai Opera (0.4 miles) - Performing arts venue at Downtown Dubai. 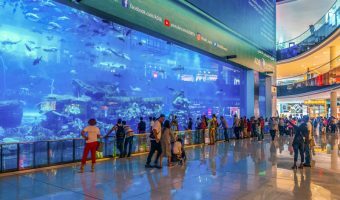 The Dubai Aquarium & Underwater Zoo (0.6 miles) - Aquarium at the Dubai Mall. 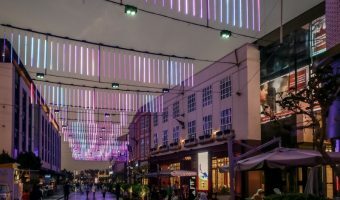 Roxy Cinemas City Walk (0.5 miles) - 10-screen cinema at City Walk. Reel Cinemas Rove Downtown (0.6 miles) - Boutique cinema at the Rove Downtown Dubai. 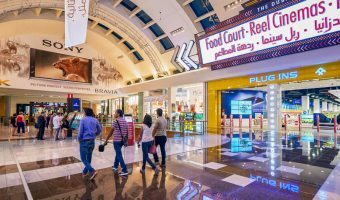 Reel Cinemas Dubai Mall (0.8 miles) - 26-screen cinema at the Dubai Mall. City Walk (0.5 miles) - Urban development with shops, restaurants, a cinema, attractions, and residential apartments. Souk Al Bahar (0.6 miles) - Souk near the Dubai Mall. At.mosphere (0.4 miles) - Restaurant and lounge on Level 122 of the Burj Khalifa. Booking essential for this once-in-a-lifetime experience. Thiptara (0.6 miles) - Thai restaurant at the Palace Downtown. Indoor and outdoor dining areas. Terrace overlooks the Burj Lake and offers good views of the Dubai Fountain and Burj Khalifa. Mint Leaf of London (0.6 miles) - Contemporary Indian restaurant on the 15th floor of the South Tower of Emirates Financial Towers, DIFC. Floor-to-ceiling windows offer great views of the Burj Khalifa. Al Grissino (0.6 miles) - Italian restaurant on the 16th floor of the South Tower of Emirates Financial Towers, DIFC. Unique bar offers spectacular views of the Dubai skyline. Bombay Brasserie (0.7 miles) - High-end Indian restaurant at the Taj Dubai in Business Bay. Features an open kitchen and luxurious interior. Offers good views of Burj Khalifa. Claw (0.7 miles) - Lively American bar and grill at Souk Al Bahar. Menu includes bucket of crabs and shellfish, burgers, seafood, steaks, and BBQ dishes. Licensed bar. Ladies’ nights, live sports, and Friday brunch. Ewaan (0.7 miles) - Arabic restaurant on the ground floor of the Palace Downtown. Live cooking stations. Friday brunch. Indoor and outdoor seating. View of the Burj Khalifa. Asado (0.7 miles) - Argentinian grill at the Palace Downtown. Waterfront terrace offers great view of the Burj Khalifa. Texas Roadhouse (0.7 miles) - American restaurant at the Dubai Mall. Offers steaks, ribs, chicken, and burgers. Large portions. Reasonably priced. Indoor and outdoor dining areas. Outdoor terrace offers view of the Dubai Fountain. Entrecote Café de Paris (0.8 miles) - French restaurant at the Dubai Mall. Offers excellent view of the Dubai Mall Waterfall. Map showing location of Burj Khalifa/Dubai Mall Metro Station. Metro station on the Red Line serving the Business Bay area. Guide to Financial Centre Metro Station. 26-screen cinema at the Dubai Mall. See what movies are showing today.